Health Care in the Media goes Wylde! In all seriousness, people will probably get sick from this. Posted on 15 April 2010 by Steve Thoms. 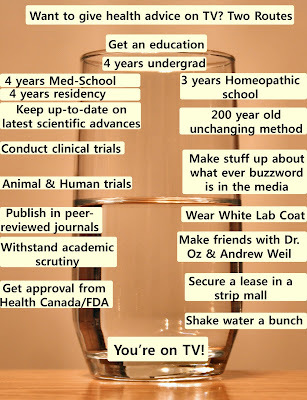 Continuing our coverage of World Homeopathy Awareness Week, today’s post focuses on a particular homeopath in Canadian mainstream media – Bryce Wylde. The media loves a good story. When it comes to science journalism, the M.O. usually centres around the so-called ‘alternative’ to the mainstream. It’s an effective narrative device that, on the one hand, has boring and stodgy ‘mainstream’ and, on the other hand, has a person who goes ‘against the grain’ and seeks ‘different ways’ of ‘thinking outside the box’. Those who construct such narratives rarely notice that these modalities are outside the box for a good reason: there is little to no credible evidence of efficacy or safety. In short, it is journalism for narration, not for communication of truth. One of the more egregious examples of this narrative-as-news is the case of Bryce Wylde, weekly host of CP24′s “Wylde on Health“. Unfortunately for the general public, sometimes there is a lot more at stake than simple storytelling. Bryce Wylde is a homeopath who is the director of a Vaughn (just north of Toronto) health clinic. This clinic offers a wide range of treatments ranging from the plausible (nutrition, massage therapy) to naked quackery (homeopathy). Wylde has a B.Sc. in biology and psychology from York University, but that is where the evidence-based science education appears to have ended, as he subsequently continued his education in homeopathy and other alternative (and unproven) modalities. When looking for some reason why I, or anyone should listen to Wylde’s health claims (such as a doctorate, or a license to practice a legitimate healthcare modality), the most I could find was that he is the director of a big clinic and he’s on TV…like…a lot! TV equals correctness, right? In the words of our own Melany Fulgam, “I didn’t know square footage was a qualification for giving medical advice”. Wylde’s bio on his clinics’ webpage makes no mention of any degree at all, opting instead to provide a laundry list of media outlets he’s been on, how many hit-counts his website gets, a political job, and that he is CEO of “Dr. In Dr. Out”, a corporate wellness company. 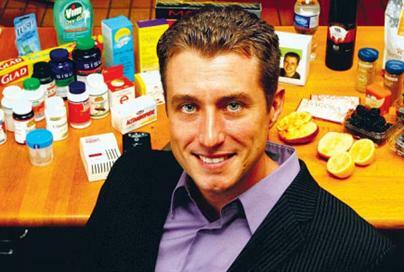 He is also the President of HGW Inc, a company which develops at home test kits which evaluate wellness markers in consumers interested in supplementing with antioxidants, vitamins, and minerals. One of the many unsubstantiated health claims that Wylde makes is that “Stress is the number one silent killer in North America” (source). It’s not clear what he means by “silent killer”, but then again, vague statements that depend on the readers’ imagination is pretty standard fare for CAM (a self-appointed moniker meaning Complementary and Alternative Medicine) practitioners. FYI, the leading cause of death in Canada is cardiovascular disease, not “stress”. While it may be true that stress can aggravate and worsen cardiovascular diseases (the supposed link may also be spurious), so too can smoking, drinking, and a sedentary lifestyle. In 2009, Wylde published a book titled, “The Antioxidant Prescription: How to Use the Power of Antioxidants to Prevent Disease and Stay Healthy for Life.” During the 1990′s, ‘anti-oxidants’ was the big medical buzzword: it had the same media-savvy sting as ‘Autism’, ‘Mercury’, ‘Aspartame’, and ‘Tar-free’. Unfortunately, the science of anti-oxidants did not live up to its hype, and there’s little evidence to suggest that supplements will prevent disease. In fact, supplementation may actually be harmful. But perhaps even more dangerous, is that Wylde advocates that there is no evidence that immunizations are safe, that no doctor or drug can ever cure you, and that you can cure yourself, “even from things like cancer”. Click here for a video (it’s on auto-start, and at the bottom of the page): his own demo reel, where he makes some of the most outrageously irresponsible health claims I’ve ever heard. That’s right, for Wylde, cancer is rust. 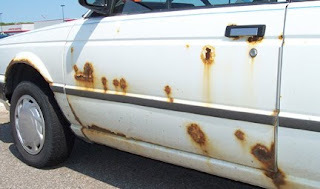 I understood oxidation and rust to be a destructive process, caused by oxygen reacting with iron-based materials, yet cancer is defined as “diseases in which abnormal cells divide without control and are able to invade other tissues. Cancer cells can spread to other parts of the body through the blood and lymph systems.” Maybe by saying “cancer is rust,” it’s simply an easier way for Wylde to sell his book and supplements. This Toyota Corolla has so much cancer! Wylde has no medical degree of ANY kind. Wylde runs a private, for-profit clinic in the Toronto area. Wylde is the CEO of a for-profit company that runs “wellness” seminars to corporations. Wylde says that drugs and doctors can’t cure you, that you can cure yourself, even of cancer. Wylde is the president of a for-profit company that develops and sells test kits and supplements. And He’s on TV? Why? So why does CP24 even allow this man a weekly spot on national television where he is free to not only dispense unqualified health advice, but also to promote homeopathy and alt-med products which he develops and sells! Look, I don’t have a medical degree. I don’t even have a science degree. But the fact that lil’ old me, a music teacher can spot such an obvious array of conflicts-of-interest, it’s a wonder why the folks at CP24 haven’t noticed what they even spell out on their own web page! I care less that Wylde operates a clinic, but for my humble opinion, he should NOT be dispensing health advice on national television. CP24: Where are your journalistic ethics? I would encourage readers to complain to the Ontario Press Council. Make sure to include relevant links and quotes, many of which are in this entry, and be specific! Bryce Wylde has no recognized medical training, yet he has a national television audience to which he can dispense medical advice. This advice often takes the form of either alarming assertions (claiming that vaccines are dangerous) or naked conflicts of interest (advocating anti-oxidants and supplements, both of which he stands to directly profit from despite a lack of robust evidence for efficacy). Instead of offering up any credentials or reliable scientific data, he piles on more and more media appearances, presenting his popularity with the media as his authority. CP24, and every other media outlet that presents Wylde as anything more than a fake doctor or a snake-oil salesman, needs to take a long, introspective look at their ethical standards before having Wylde on again. *Update: Correction, malaria is not caused by a virus, but by a eukaryotic protist. Thanks to commenter ‘Mozgluboz’ for the note! Correct sir you are not a physician, nor doctor, nor scientist. Men of science make assessments and rarely assumptions. Men of social sciences and arts degrees make many assumptions and few assessments, especially as they relate their statements to science. Perhaps you as many do, revel in their ignorance and profound naivety when it comes to science and scientific knowledge. Science must be respected whether you like it or not. Obviously your skeptic(ignorant) readers will have to back you up on this one, as I most assuredly will go over your head. And if you think that Wylde has a conflict of interest, perhaps you should pay closer attention to the ghostwriting and fabricated journals attributed to Big Pharma. Of course physicians educate themselves thoroughly when a detail man comes to town and “sells” them on a new product to dispense. Lies and deceit are rampant when kickbacks, free trips and palm greasing become the treat of the week when a detail man pushes his wares. And of course direct to consumer advertising via drug ads in no way influences appropriate patient care. Now for an education. Ignorance is no substitute for knowledge music teacher. And this scientist will learn you. References to the scientific literature representative of homeopathic research are presented below. Cited are both medical and related journal articles, including books or compendiums of research into the physics, biophysics, materials science, and chemistry of related homeopathic preparations and their application to biologic systems. It has been claimed that preliminary water treatment with magnetic or electromagnetic (EM) fields can help descale metal surfaces, improve cement hydration, change z potential of colloids, make plants irrigated with such water grow faster, enhance efflux of calcium through biomembranes or influence the structure of model lyposomes. The effects persist minutes or hours after the water treatment. It is well known that relaxation phenomena in water occur on a picosecond to second timescale. The nature of these ‘mysterious’ and questionable phenomena uniquely known as the ‘magnetic memory of water’ has recently been scrutinized. Based on our recent work as well as other recent publications, we propose a model for the observed phenomena. We propose that the gas liquid interface is perturbed by the action of magnetic and electromagnetic fields. We investigated whether water has a ‘memory’ for succussion compared to unsuccussed controls. The method is based on a bioassay using dinoflagellates. The duration of memory measured by this method is at least 10 min, and may be longer. The effect may be based upon solitons. A hypothesis about the mode of action of homeopathy may be experimentally investigated by this method. This paper provides an interdisciplinary base of information on the structure of liquid water. homeopathic remedies, provides another rich data base. which are the basis of an enormous range of claims about specially “structured” water. 4. The ‘Memory of Water’: an almost deciphered enigma. Dissipative structures in extremely dilute aqueous solutions. In the last decade, we have investigated from the physicochemical point of view, whether water prepared by the procedures of homeopathic medicine (leading inexorably to systems without any molecule different from the solvent) results in water different from the initial water? The answer, unexpectedly, but strongly supported by many experimental results is positive. We used well-established physicochemical techniques: flux calorimetry, conductometry, pHmetry and galvanic cell electrodes potential. Unexpectedly the physicochemical parameters evolve in time. The water solvent exhibits large changes in measurable physicochemical properties as a function of its history, the solute previously dissolved, and time. In particular we found evidence of two new phenomena, both totally unpredicted, in homeopathic dilutions: the presence of a maximum in the measured physicochemical parameters vs sample age, and their dependence on the volume in which the dilution is stored. These new experimental results strongly suggest the presence of an extended and ‘ordered’ dynamics involving liquid water molecules. this type of inquiry into the nature of homeopathically prepared medicines. investigating the influence of the frequency of the NMR spectrometer on results obtained. opened the door for investigation of the effect of various potentisation methods. took this one step further by investigating the mechanics of the succession process. These researchers interpreted their results based on the theories of Resch and Gutmann and Anagnostatos. This body of knowledge has inspired Allsopp to look into the effect of energy transfer into the solution – whether it is imperative that the energy is imprinted mechanically by hand production of the remedies, or if it can equally be achieved through electromagnetic means. In comparing the studies, it is evident that both trituration and serial dilution changes the physico-chemical properties of the solvent to produce distinct medicines. may be used for low potencies and only with the best available instrument. Ross, A. H. A. (1997). An evaluation of Hahnemannian quinquagenimillesimal potencies using nuclear magnetic resonance spectroscopy. Department of Homoeopathy. Durban, Technikon Natal. Master’s Degree in Technology: Homoeopathy: 71. Power, S. M. (1999). An appraisal of Homoeopathic Quinquagenimillesimal Potencies of Plumbum metallicum and Stannum metallicum by means of Nuclear Magnetic Resonance Spectroscopy. Department of Homoeopathy. Durban, Technikon Natal. Master’s Degree in Technology: Homoeopathy: 72. Malan, J. F. (2002). A comparison of Centesimal and Decimal Hahnemannian potencies using Nuclear Magnetic Resonance Spectroscopy. Department of Homoeopathy. Durban, Durban Institute of Technology. Master’s Degree in Technology: Homoeopathy: 91. Williams, D. A. R. (1986). Nuclear Magnetic Resonance Spectroscopy. Chichester, John Wiley & Sons. Milgrom, R., K. R. King, et al. (2001). “On the investigation of homeopathic potencies using low resolution NMR T2 relaxation times: an experimental and critical survey of the work of Roland Conte et al.” Br Homeopath J 90(1): 5-13.
firstly by the modified photomultiplier-method and secondly by the Tesla-coil method. photons by succussion in alcoholic dilutions and in triturations. the day. Reproducibility has not yet been possible. technique might open perspectives in dilution research. structures (so-called dissipative structures) resulting to their preparation. are substantially different from one dilution to its original solvent. Anagnostatos, G. S. (1994). Small water clusters (clathrates) in the preparation process of homeopathy. Fundamental Research in Ultra High Dilution and Homeopathy. P. C. Endler and J. Schulte, Kluwer Acad Publ. Bellavite, P. and A. Signorini (2002). The Emerging Science of Homeopathy: Complexity, Biodynamics, and Nanopharmacology. Berkeley, USA, North Atlantic Books. Smith, C. W. and S. Best (1989). Electromagnetic Man. London, J.M. Dent and Sons Ltd.
Antonchenko, V. and V. Ilyin (1992). “Points at issue in the physics of water and homoeopathy.” Br Homeopath J 81(2): 91-93. Shaw, D. (1976). Fourier Transform Spectroscopy. Amsterdam, Elsevier Scientific Publishing Company. K. Lenger, Homeopathic potencies identified by a new magnetic resonance method, Subtle Energies and Energy Medicine 15,3, (2006), pp. 225–243. Rao ML, Roy R, Bell IR and Hoover R. The defining role of structure (including epitaxy) in the plausibility of homeopathy. Homeopathy 2007; Vol 96, Issue 3:175-182. Homeopathy was born as an experimental discipline, as can be seen from the enormous amount of homeopathic data collected over more than two centuries. However, the medical tradition of homeopathy has been separated from that of conventional science for a long time. Conventional scientific wisdom dictates that homeopathy should have no effect above placebo but experiments on ultra-high dilutions of solutes together with some clinical data suggest the intriguing possibility that it might do in some circumstances. Today, an osmotic process between disciplines, previously seen as in conflict, is facilitated because over the last few decades homeopathy has initiated the methods of current medical science and a substantial number of experimental studies—at molecular, cellular and clinical levels—are available. One area of dialogue and of common progress is that of inflammation and immunity, probably because these are closely related to the traditional ‘vital force’ of the body’s self-healing power. In a series of papers we review the historical origins of homeopathy, the laboratory and animal models related to the field of immunopharmacology, the clinical evidence in favor and against the use of homeopathy in the inflammatory diseases and the hypotheses regarding its action mechanism(s). Finally, we will enlighten the specific characteristics of the homeopathic approach, which places great emphasis on identifying a cure for the whole organism. Here we describe the results of some experimental laboratory studies aimed at verifying the efficacy of high dilutions of substances and of homeopathic medicines in models of inflammation and immunity. Studies carried out on basophils, lymphocytes, granulocytes and fibroblasts are reviewed. This approach may help to test under controlled conditions the main principles of homeopathy such as ‘similarity’ of drug action at the cellular level and the effects of dilution/dynamization on the drug activity. The current situation is that few and rather small groups are working on laboratory models for homeopathy. Regarding the interpretation of data in view of the simile principle, we observe that there are different levels of similarity and that the laboratory data give support to this principle, but have not yet yielded the ultimate answer to the action mechanism of homeopathy. Evidence of the biological activity in vitro of highly diluted-dynamized solutions is slowly accumulating, with some conflicting reports. It is our hope that this review of literature unknown to most people will give an original and useful insight into the ‘state-of-the-art’ of homeopathy, without final conclusions ‘for’ or ‘against’ this modality. This kind of uncertainty may be difficult to accept, but is conceivably the most open-minded position now. A search of the literature and the experiments carried out by the authors of this review show that there are a number of animal models where the effect of homeopathic dilutions or the principles of homeopathic medicine have been tested. The results relate to the immunostimulation by ultralow doses of antigens, the immunological models of the ‘simile’, the regulation of acute or chronic inflammatory processes and the use of homeopathic medicines in farming. The models utilized by different research groups are extremely etherogeneous and differ as the test medicines, the dilutions and the outcomes are concerned. Some experimental lines, particularly those utilizing mice models of immunomodulation and anti-inflammatory effects of homeopathic complex formulations, give support to a real effect of homeopathic high dilutions in animals, but often these data are of preliminary nature and have not been independently replicated. The evidence emerging from animal models is supporting the traditional ‘simile’ rule, according to which ultralow doses of compounds, that in high doses are pathogenic, may have paradoxically a protective or curative effect. Despite a few encouraging observational studies, the effectiveness of the homeopathic prevention or therapy of infections in veterinary medicine is not sufficiently supported by randomized and controlled trials. The evidence-based research of the effectiveness of homeopathic medicines in common immunologic disorders is reviewed. In part 1, we introduce methodological issues of clinical research in homeopathy, and criteria utilized to evaluate the literature. Then 24 studies (12 randomized and 12 non-randomized) on common upper respiratory tract infections and otorhinolaryngologic complaints are described. In part 2, the focus will be on allergic diseases and the effectiveness of homeopathy will be globally evaluated and discussed using the criteria of evidence-based medicine. The « gold standard », accepted principally by conventional medicine to evaluate the efficacy of a remedy is referred to as a meta-analysis or a systematic audit of RCTs. Since 1991, 6 comprehensive reviews concerning homeopathy were published. The conclusion arrived at concerning all comprehensive systematic reviews was that homeopathy elicits a positive and specific effect greater than placebo alone. Several randomized and controlled studies (RCT) showed a statistic significant difference between homeopathy and placebo. interpretable results. Meta-analysis based on validated criteria. * 77% of the studies show positive result for homeopathy. *The results are mostly favourable for homeopathy regarding the quality of trials. Boissel en al. 1996 (19) Report for the European commission. 15 studies. Inclusion of only very rigorous studies (highest quality). * Combined p-values for the 15 studies is significant. (p = 0.0002). Linde en al. 1997 (20) The Lancet. 89 studies. coefficient was 1.62 (95% CI, 1.17-2.23). * Further pragmatic research is justified. Cucherat en al. 2000 (22) European Journal of Clinical Pharmacology. * Publication bias is unlikely. * More clinical trials are needed. is based on a selection of 8 trials. I do think Wylde has a conflict of interest, and that it is unethical that he does not disclose it. I have provided evidence. Lots of it. And that you are effectively telling me (and everyone else) to look the other way simply because “big pharma” also engages in similar unethical behavior (which no one denies), tells me a great deal about your own dishonesty and ideological motivations. Your extensive citation of pro-homeopathy articles (all of which have already been long debunked) amounts to little more than copy and pasting, and it borders on plagiarizing. Being that this article is about Wylde’s questionable ethics and media presence, and not about homeopathy, your response is nothing more than a non-sequitur in defense of homeopathy. If you think that anything I said about Wylde’s business connections is incorrect, leave your evidence. Leaving evidence in defense of homeopathy is misplaced, and again, is a non-sequitur. It’s true that I am but a simple music teacher with a humanities education. I can tell you that, using my humanities education, your reading comprehension and argumentative skill needs a little more work. This article is about Wylde and his claims. Not about homeopathy. How such a quack has been given a mouthpiece to promote his own sham practice is astounding. If the only harm he were causing was simply fleecing his unsuspecting clients that would tolerable. Sadly the harm runs much deeper. As for Toxicosis chiding you for not being a scientist or a doctor, well I am. There is no credible evidence in support of Homeopathy in any respectable scientific journal. 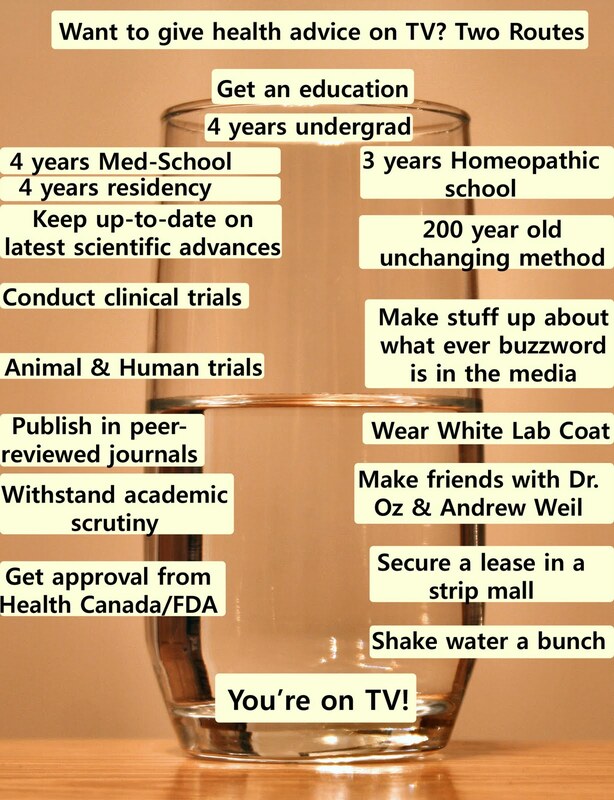 The garbage references he or she cites are all from homeopathy journals. The best evidence currently available overwhelmingly shows that Homeopathy is NONSENSE. No, it is not. His own company is the main sponsor of the programme. In other words, the programme is paid advertising. I’m not a scientist, but work in medicine and have been obsessed with the alternative medicine vs. conventional medicine debate for years. For years alternative medicine has promoted the power of echinacea to boost your immune system. Now Mr. Wylde on health informs me that echinacea has a compound that suppresses the immune system, unless it is of a specific variety…of which he is currently promoting. Have ND’s been wrong all these years? I’ll have to see the commercial again…maybe I can find it online. BTW…where would I begin telling you what’s wrong with your post regarding homeopathy? The quality of studies? The evidence for water memory? If we are only beginning to understand the nature of water memory, homeopaths would never have been able to find it back then let alone control or predict dosages and outcomes…I’ll clarify if need be in a later post. I’m so angry that CP24 allows what is essentially an infomercial to be aired as medical advice. Every new clip that comes out makes me scream at my TV. I suffered from anxiety, panic disorder, and depression for a long time and fooling people into thinking ginger, omega 3s, and supplements are a cure is not only irresponsible but should be criminal. I lost a year or two off my life trying everything I could to avoid real medication while these upstairs college charlatans spread false remedies. Steve is a professional music teacher living in Kitchener, Ontario. He studied recorded music production at Fanshawe College, and Political Studies/History at Trent University, where he specialized in political economy and global politics. He is an amateur astronomer, and an award-winning astro-photographer. Steve also runs the blog, Oot and Aboot with Some Canadian Skeptic." can can be followed on Twitter, @SomeCndnSkeptic. Dr. Abs to the ER. Dr. Abs to the ER. He's Trolling, He's Trolling, He's Trolling down the Wifi!